Net sensors; standard Scanmar sensors, bottom contact sensor and depth / temperature logger (DST). 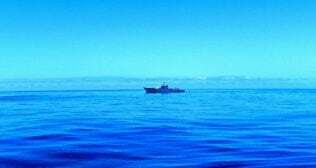 To undertake a nationally co-ordinated demersal trawling survey of anglerfish on the Rockall Plateau and to the west of the Hebrides. This is a nationally co-ordinated trawl survey to estimate the abundance and distribution of anglerfish. The survey follows a set of protocols drawn up by an industry / science survey planning group made up of Marine Scotland scientists and fishing representatives. These protocols share much in common with the sampling regimes described in Marine Scotland’s standing instructions for demersal trawl surveys. The survey track and sampling locations (randomly selected) will be delivered to the Captain and Fishing Master prior to departure and giving as much notice as possible. An approximate map of the sampling area giving the locations of all of the co-ordinated surveys is appended as Figure 1. Trawling in Irish waters will take place as necessary. Fishing operations will take place on a 24 hours basis, with scientific teams split into two teams working 12 hours on, 12 hours off (midnight – midday – midnight). One haul of 60 minutes duration will be made at each sampling station; trawling operations will occur in waters up to a maximum of 1000 m. The Scanmar system will be used to monitor trawl parameters such as wing spread, door spread and headline height. A bottom contact sensor will be mounted on the footrope to record touchdown/lift-off at block up/knockout and if the ground gear leaves the seabed during the haul. Anglerfish and megrim catches will be worked up according to the protocols for this survey. Other target species such as haddock, cod, saithe, blue ling, lemon sole and skates etc will be sampled as and when available. 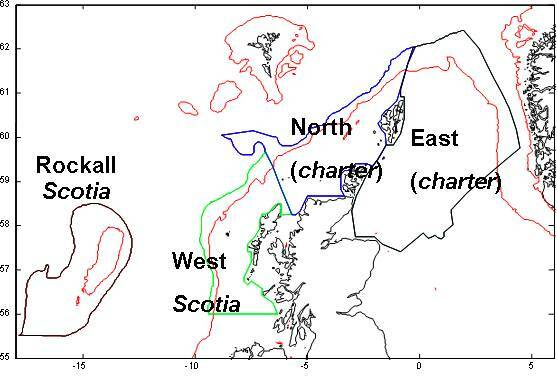 Map of the Northern Shelf of the North East Atlantic with the areas to be surveyed by the vessels (in italics) in the forthcoming anglerfish survey. (The red lines indicate the approximate position of the 200 m depth contour). Details of stations assigned to the Rockall and ‘West’ area will be conveyed to the vessel prior to sailing.